This gorgeous buffet gives lots of room for storing dishes and silverware for those special occasions or everyday use. A large top surface gives plenty of space for serving those large family gatherings. 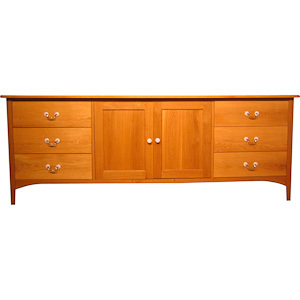 The buffet as shown has a large double door center section for big pieces. The center section has a single adjustable shelf. The shelf is only half the depth to allow room for very tall items. Three drawers on either side of the center section provide storage for silverware and dishes. All drawers use heavy-duty ball bearing drawer slides to support the weight of china or stoneware. A smaller version of this piece is available without the center cabinet section. Also I would be happy to design a buffet to meet your exact needs. You can select the hardware to meet your decor.